I discovered how to map a linear lens, from destination coordinates to source coordinates. How do you calculate the radial distance from the centre to go from fisheye to rectilinear? 1). I actually struggle to reverse it, and to map source coordinates to destination coordinates. What is the inverse, in code in the style of the converting functions I posted? I have some points that describe positions in a picture taken with a fisheye lens. I want to convert these points to rectilinear coordinates. I want to undistort the image. I've found this description of how to generate a fisheye effect, but not how to reverse it. Input : Original image with fish-eye distortion to fix. Output : Corrected image (technically also with perspective correction, but that's a separate step). Alternatively, I could somehow convert the image from fisheye to rectilinear before finding the points, but I'm completely befuddled by the OpenCV documentation. Is there a straightforward way to do it in OpenCV, and does it perform well enough to do it to a live video feed? is the formula you're looking for. 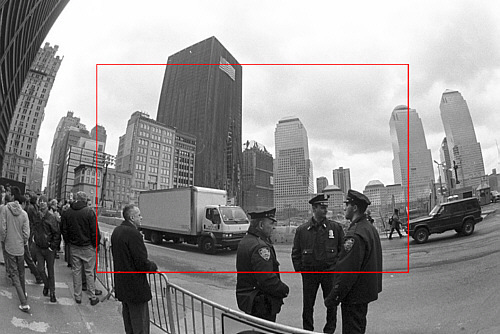 Estimating the focal length f can be solved by calibrating the camera or other means such as letting the user provide feedback on how well the image is corrected or using knowledge from the original scene. 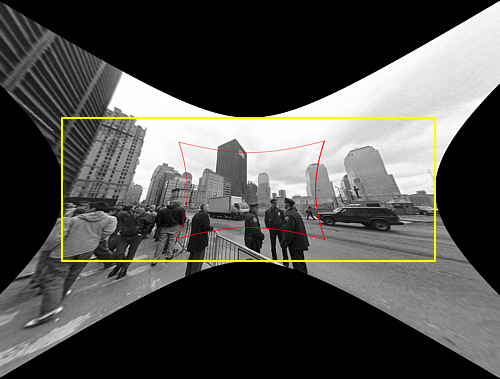 Also note that OpenCV uses a very different lens distortion model to the one in the web page you linked to. I got to this point through trial-and-error: I don't fundamentally grasp why this code is working, explanations and improved accuracy appreciated! (note: values can be out of range)"""
By tweaking first A, then higher-order coefficients, you can compute any reasonable local function (the form of the expansion takes advantage of the symmetry of the problem). In particular, it should be possible to compute initial coefficients to approximate the theoretical function above. Also, for good results, you will need to use an interpolation filter to generate your corrected image. As long as the distortion is not too great, you can use the kind of filter you would use to rescale the image linearly without much problem. If you plot the above formula alongside tan(Rin/f), you can see that they are very similar in shape. Basically, distortion from the tangent becomes severe before sin(w) becomes much different from w.
I took what JMBR did and basically reversed it. He took the radius of the distorted image (Rd, that is, the distance in pixels from the center of the image) and found a formula for Ru, the radius of the undistorted image. You want to go the other way. For each pixel in the undistorted (processed image), you want to know what the corresponding pixel is in the distorted image. In other words, given (xu, yu) --> (xd, yd). You then replace each pixel in the undistorted image with its corresponding pixel from the distorted image. where f is the focal length in pixels (I'll explain later), and r = Ru/f. The focal length for my camera was 2.5 mm. The size of each pixel on my CCD was 6 um square. f was therefore 2500/6 = 417 pixels. This can be found by trial and error. Finding Rd allows you to find the corresponding pixel in the distorted image using polar coordinates. theta = arctan( (yu-yc)/(xu-xc) ) where xc, yc are the center points. Make sure you know which quadrant you are in. //which quadrant are we in? I blindly implemented the formulas from here, so I cannot guarantee it would do what you need. Use auto_zoom to get the value for the zoom parameter. crop_factor is ratio of sphere diameter to diagonal of the source image"""
""" calculate zoom such that left edge of source image matches left edge of dest image """
I found this pdf file and I have proved that the maths are correct (except for the line vd = *xd**fv+v0 which should say vd = **yd**+fv+v0). It does not use all of the latest co-efficients that OpenCV has available but I am sure that it could be adapted fairly easily. Not the answer you're looking for? Browse other questions tagged math graphics geometry projection or ask your own question. How can I transform a fish_eye image to a flat rectangular image? How can I do fisheyes correction in Python without knowing the contours? Is a top-left origin coordinate system what's stopping this equation from working? How to convert spherical coordinates to equirectangular projection coordinates?